If you've ever been to the Smokies chances are you've heard of Mt. LeConte. The big mountain with three peaks looms over the towns of Sevierville, Pigeon Forge, and Gatlinburg and is visible as you drive towards your vacation destination as soon as you hit the 407 exit. While this mountain in the park isn't the tallest (it's the third tallest, after Clingman's Dome and Mt. Guyot), it's definitely the most famous! In fact, when the writers of the song Rocky Top, the University of Tennessee's fight song, got together to write the song they were sitting in Gatlinburg looking at Mt. LeConte! If you're wanting to hike up one of the five different trails going up Mt. 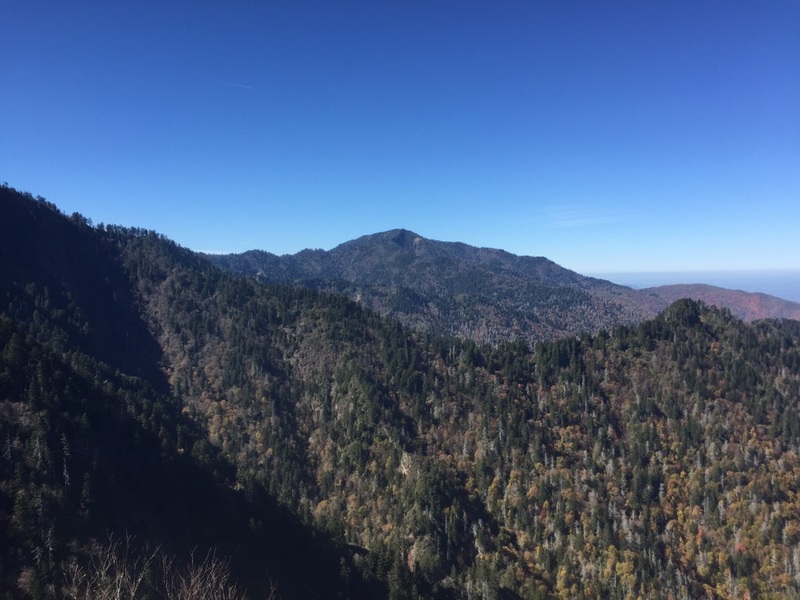 LeConte, chances are you'll choose Alum Cave Trail. This trail is the shortest route, although not necessarily the easiest route, up to the summit. I recently hiked up the Alum Cave Trail and down the Rainbow Falls Trail on the opposite side of the mountain for a guided hike. Here's a recap of the new and improved Alum Cave Trail. When we first stepped on trail I was definitely impressed at all the hard work the crews have put in on this trail. Alum Cave Trail is in the process of being rebuilt and is wide enough for the large crowds it attracts now! The first 1.2 miles up to Arch Rock were pretty uneventful and the new staircase inside is easy to navigate and looks amazing (sorry I didn't get a photo of this one). From here we had a little more climbing before stopping at Inspiration Point - a heath bald with views of the natural arches over on Little Duckbill and the Eye of the Needle. At this point, we're still climbing what is known as Peregrine Peak, named for the bird that is also nesting here over on Little Duckbill and at the Eye. There is an incredibly hefty fine for going off trail to that area and disturbing the birds. After our break, we climbed up to the namesake of this trail - the Alum Cave Bluff. This sandy "cave" is a microclimate here in the Smokies and is actually considered a desert! It's hard to believe in a park with temperate rainforest you can still have a desert. The "cave" also has a big of a sulfuric smell, like that of spent matches. This soil is full of oxalates and contains minerals that can be found nowhere else on earth. A dry streamed where once a flash flood roared down this mountain. After continuing uphill from the Alum Cave Bluff the crowds began to thin a bit. We mostly saw college students climbing up or down the mountain now being that it's spring break time for most colleges along the east coast. We continued to climb, now being aided with steel cables in places to help hikers along in winter, and finally reached a flatter spot in the trail. The forest type has now changed from old growth to boreal - meaning most of the forest is evergreen spruce trees and fir trees. The sun shining made it smell like we were hiking on a mountain of Christmas trees and we had finally reached our destination for the day - the summit of Mt. LeConte. We took a break up top and watched the seasonal workers scurrying around stocking the cabins and the office for the upcoming season. The lodge isn't open year-round and is just now getting ready to open for the season. A view of the AT from the Alum Cave Trail. When we were ready to head downhill we took the Rainbow Falls Trail down to Cherokee Orchard. This trail has been one of my favorite routes up or down this mountain for a long time due to the easier grade and the views into the valley and Gatlinburg. It was fun getting a glimpse of town, knowing it was so busy down there and we were realtively alone on this part of the mountain. Rainbow Falls Trail doesn't see the crowds you'll get on the Alum Cave Trail and, until we hiked down to the falls, we didn't see any other people. On the way down we found a patch of teaberry that actually still had their berries. It's always fun eating wild red berries that taste like peppermint instead of fruit. We took our final break at Rainbow Falls and saw relatively few people there, but that may have been due to the fact that it was getting late in the day. So many creatures living on one rock - rhododendron, moss, spray paint lichen, and crepe myrtle! About half a mile down from the falls we spotted people illegally camping in a patch of rocks next to LeConte Stream. Given that this mountain has seen a wildfire from this type of activity only a few years ago, we did let the campers know they weren't supposed to be camping there and certainly weren't supposed to be building a fire inside a hollowed out log in a rock pile! The Smokies have strict rules as to where you can and cannot camp due to it being the most visited national park in the country. Our park has been loved to death in generations past and the rule helps protect the park and keep it from becoming a giant, scarred wasteland of former campsites and garbage. After this encounter however, we had an uneventful walk down LeConte Creek to the vehicles we had in the parking lot. I love hiking Mt. LeConte and it's especially fun when you can hike up one side and down another. To do the hike we did you'll need to have two vehicles or use a local shuttle service to help you get from your car to your starting point. Here is a map of the direction we hiked the trail. We started on Alum Cave Trail (the bottom) and hiked to Rainbow Falls Trailhead (the top). Have you ever hiked up Mt. LeConte or stayed in the lodge at the top? The historic lodge dates back to 1925 - before the Smokies even became a national park! I'd love to hear about which trails you hiked up or down and what you thought of the them. Leave me a comment below or find me on Facebook or Twitter to get the conversation started. 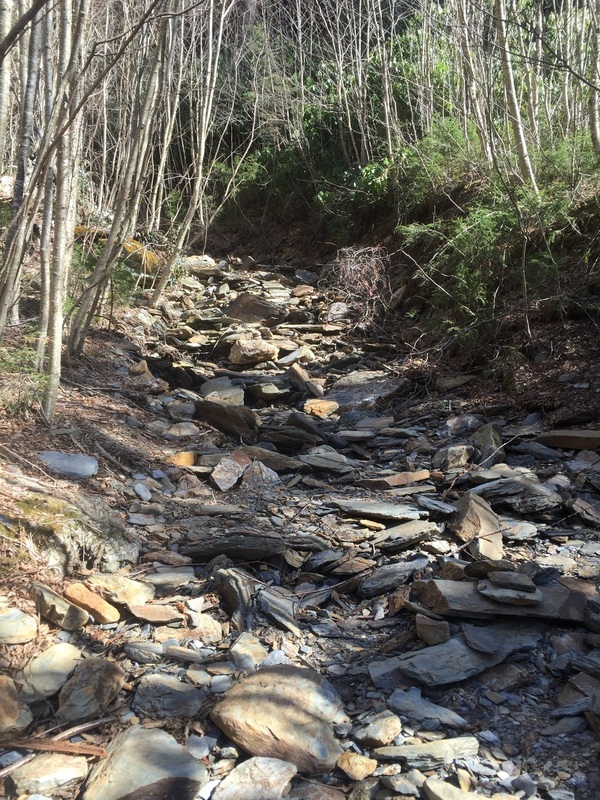 Despite having nearly 900 miles of maintained trails in the Smokies, sometimes the coolest hikes aren't on the official trails. Because the national park used to be many private properties, it's not uncommon to hear of old buildings or long forgotten waterfalls being off the beaten path. One of the more popular off-trail hikes in the park is only a few miles away from the Sugarlands Visitor Center - Courthouse Rock. The trail to Courthouse Rock begins on a nondescript vehicle pull-off on the side of the road. Since this isn't an official maintained trail, it's not marked with any signs like most other trails in the park. We began by hiking up a faint path to an old road bed. We followed the old road bed for about a quarter of a mile, stepping over and around numerous downed trees, before coming to a stream crossing that despite the heavy rainfall a week ago was an easy rock hop. The trail began a steeper uphill now, going past an old homesite before heading into a rhododendron tunnel. Near the top of the tunnel, we stopped to take in a view of the Bullhead portion of Mt. LeConte. After getting back on the main trail and walking a little further up a very well-defined trail we saw the trail ahead of us marked with a large "X" made from sticks. We turned to our right to see a more narrow and less-defined path leading uphill into the woods. A short time later we came out right at Courthouse Rock. While the Smokies is home to many great large boulders, this one is definitely impressive! The rock was too large to get a decent photograph, but we walked around to the back of the rock to see some ancient graffiti dated 1827. There was also an old penny stuck in between layers of the rock. We headed back down the trail to the old homesite and observed some Eastern Hemlock trees actively being attacked by the wooly adelgid before heading down to the waterfall on a side trail. We stopped at this waterfall to sit in the sun and have a snack before heading back down to the parking area. On the way back down we found a large patch of toothwort growing and got to taste a few small samples. We also found a crawdad claw in a tree, which was really interesting. Our theory is a bird snatched it up and was having a snack, dropping it into the crack of the tree. While we were out on trail this time we didn't make it up to the Quilliams Cave, which I've been told is only about a mile up from the rock. Have any of you been up to the cave? I'd love to know which way to head from Courthouse Rock to find it. Leave me a comment here or catch me over on Facebook or Twitter and let me know! Our final REI Adventure of the season was finally happening! 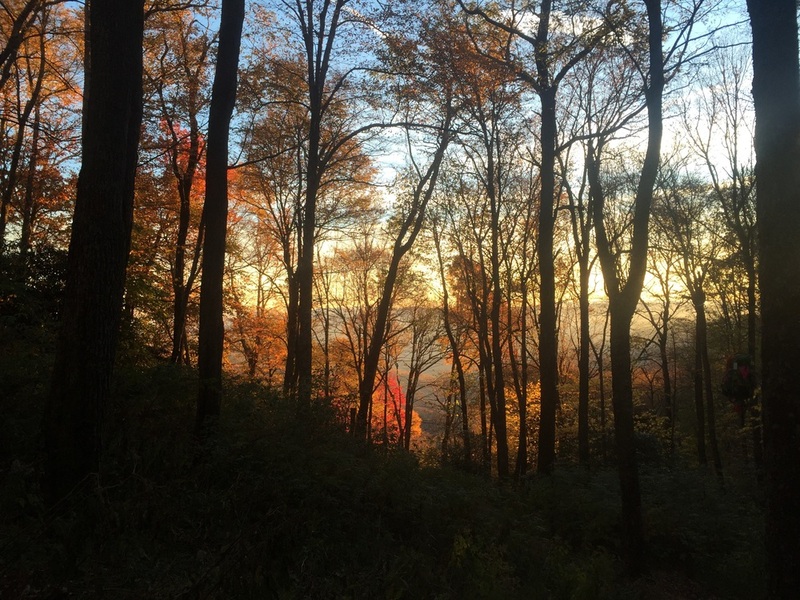 November 1-4 I spent out on the Appalachian Trail with six clients and another guide, Blue. Throwing a wrench into our hike was not only the fact that is is now November and the weather is much more unpredictable, but also the time change occurred the night before this trip. This means that now instead of getting dark at 6:30 or so, the darkness would set in the woods around 5 p.m. Thankfully, we had a great group of clients who trusted in our instincts and let us run a little wild with our trip planning. After doing our general pack shakedowns and picking out our meals for the trip, we shuttled up and into another part of the Smokies. Our hike for the day originally had us hiking 5.5 miles from the insanely busy Newfound Gap Parking lot, hiking mostly downhill to Kephart Prong Shelter. Since it was already 1:30, Blue and I took the decision to park down the hill at the Kephart Prong trailhead and hike in the two relatively easy miles to the shelter, only gaining approximately 850 feet along the way. This decision turned out to be better for a variety of reasons - Blue had never seen this part of the trail before and there were tons of wild eatables, including Toothwort (tastes like horseradish), black birch, partridge berry, and stinging nettle to name a few. We got to take our time to get to know each other and taste a variety of wild plants on our hike. This also got us to the shelter earlier, meaning we still had some daylight hours to let people look around and take time to learn the bear line system in the park before dark. Blue built us all a fire and we got a chance to get to know each other a little better as darkness, and eventually the rain predicted, fell throughout the night. The next morning, day 2, we awoke to rain, but we knew there was a 90% chance of it all day long. This turned out to be absolutely true. We left the shelter for our hike up the Grassy Branch Trail and the steady drizzle turned into a heavier sprinkle before turning into a full on downpour. We steadily climbed throughout the morning before coming to the Dry Slucie Gap trail. Dry Slucie is not how I'd describe our morning at all! The trail had turned into a stream and we were all thoroughly soaked before we made the 1.3-mile trek to the AT at Porters Gap. When we got onto the AT the temperature had seemed to drop by about 15 degrees. Thanks to being on the ridgeline the winds were whipping up the North Carolina side of the hill and blowing right through us. Now wet and cold, we kept moving as much as we possibly could before stopping for lunch on the warm side of the hill. We climbed through the Sawteeth, down into False Gap, and up to Bradley view with few moments for stopping and interpretation due to all of us being soaked and cold. From Bradley View, which we saw none of in the thick cloud cover and fog, we had a quick push up and over Laurel Top before heading down to Peck's Corner. Blue and I were so grateful for having a strong crew of hikers who kept smiling despite the terrible weather. Rhododendron tunnel hiking on a rainy morning. After getting to Pecks, the rain continued and I made three trips down the hill in the slippery mud for water. The third trip was unplanned, but necessary due to me spilling our entire 9 liter water bucket on my shoes. Good thing it was already raining! Thankfully, while I was getting water and heating water for everyone to have some warm drinks, our awesome guide Blue was out fetching firewood. Thanks to some Wetfire (an awesome firestarter! ), Blue was able to get a crazy warm and huge fire started in the indoor fireplace. After all the clients went to bed, I stayed up and dried my clothes, rain gear, and socks in front of the fireplace before calling it a night. Fog rolling up the mountain. Day 3 saw the end of the rain and Blue and I kept hoping we could wish the clouds away. We tried hanging around in the shelter until 10 a.m. to get everyone a view and some blue skies, but it just never happened. We started our hike up and out of Peck's Corner and back to the AT in the same damp and dreary weather we had seen the day before. The wind, however, was thankfully absent from our trip today! We climbed up to Eagle Rocks, where again we had not too much in the way of views, and began the highlight of any trip - our solo hike. I hiked all the way to Copper Gap before stopping because I had seen a glimpse of blue skies and sunshine. It unfortunately didn't last, but we all had gotten a moment of sunshine and a little bit of blue sky. After we all ate our lunch and hiked on, I mentally prepared everyone for our last push of the day up Mt. Chapman. Imagine my surprise when, after all the psyching up, we actually ended up being at the shelter, having already climbed the mountain and not noticing! A rare minute of sunshine on day 3! We spent the night at Tricorner Knob and slowly, the shelter began to fill. Nick and his wife, who actually read this blog, had come in from Icewater Springs and slowly five SoBo thru hikers came in for the night. The SoBo's got some trail magic from our group in the form of food none of us ever cared to finish eating and in return taught some of our clients a card game. We again had a fire and during the course of the evening, the sky had cleared and we had amazing views of the stars with a little bit of Milky Way action! Our last morning, day 4, brought clearing skies and the views we had hoped for the entire trip. We stopped to take a ton of photos and by the time we reached the Deer Creek Gap helipad we had some beautiful scenery. Blue and I decided to take our crew down the Snakeden Ridge Trail to give our clients more miles on this warm and sunny day. We had a brutal 4080-foot descent, but we reached the campground at 3:30 p.m. We were so lucky to have a strong and amazing group of clients to lead on our last trip of the season. My most recent trip as an REI Adventures guide had me taking our clients northbound on the AT this time. With the fall colors only a few days away from peaking, I was excited to spend a sunny and unseasonably warm four days above the valley on the Appalachian Trail. As all of our trips begin, we met the clients in the parking lot for introductions and pack shakedowns. Again we were very blessed to have a group that was well-prepared and not carrying too much extra gear. Unlike most of our trips, however, today we had an 11 mile hike to our shelter being that reservations for Icewater Springs were already booked. 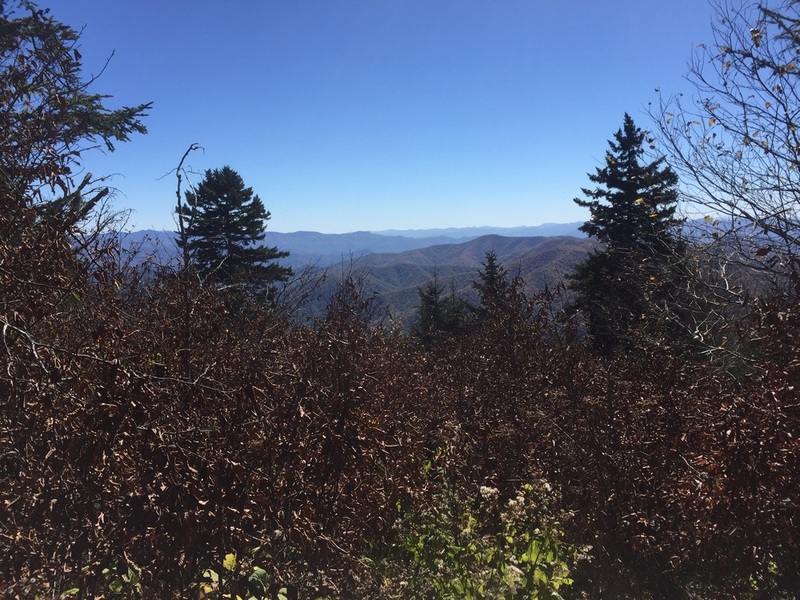 We began our hike by hiking immediately on the Appalachian Trail up and out to Charlie's Bunion where we took a mini break for lunch and taking in the views of Mt. LeConte and the valley below. The fall colors were absolutely stunning, but we couldn't afford much time to take them in due to losing daylight and the mileage still left to cover. We hiked a few more miles before stopping at False Gap, the site of a former AT shelter, to stop and get water. From here, we had a short and steep uphill hike to one of the best views on this side of the park - Bradley View. We took some time here before heading onward to Hughes Ridge Trail and the site of Peck's Corner shelter, arriving just before sunset thankfully! Our second day on trail afforded us a late start as we were only going the 5.8 miles to the next shelter, Tricorner Knob. We began a short uphill hike to Eagle Rocks - another stunning view on this side of the park - and then began our solo hike for the day. As I've said in other posts, solo hiking on these trips are a beautiful thing. You have a chance to walk off your problems of the past few days and sort things out, which is never a bad thing. After hiking about a mile and a half solo, we all met back up to summit Mt. Chapman and head downhill to the Tricorner shelter. Our crew got to meet some AT thru hikers today, however, unfortunately the three that shared the campsite with us were more than a little feral and pretty hostile toward anyone on trail that wasn't one of "them". After attempting to talk to them and enjoy their company, I eventually gave up and we all went to bed early. Losing daylight at Bradley View. The third day on trail afforded yet another late start as we were only hiking to Cosby Knob shelter a mere 7.5 miles away. Today afforded us skirting the summit of Mt. Guyot and Old Black - the third and fourth highest peaks in the park and site of an off-trail adventure I took only a few months before my 2012 thru hike. We took a long break at Deer Creek Gap at the site of the old helipad before we all headed down to the Snakeden Ridge Trail and the site of the F4 plane crash from 1984. We began yet another solo hike down to Camel Gap Trailhead. After taking a final break here, we had a short and easy push into Cosby Knob shelter. We spent the night with a few thru hikers and the Smokies Ridgerunner, Maury. For those of you who don't know about Ridgerunners, they are employed by the Appalachian Trail Conservancy. They cover nearly the entire length of the AT and hike designated areas five days a week, living on the trail and being stewards. They will answer any questions you have about the area, as well as educate people on leave no trace ethics. They also have to clean up any trash or clothing left behind, make sure the privy has mulch or duff for composting, and tidy up shelters before heading out. 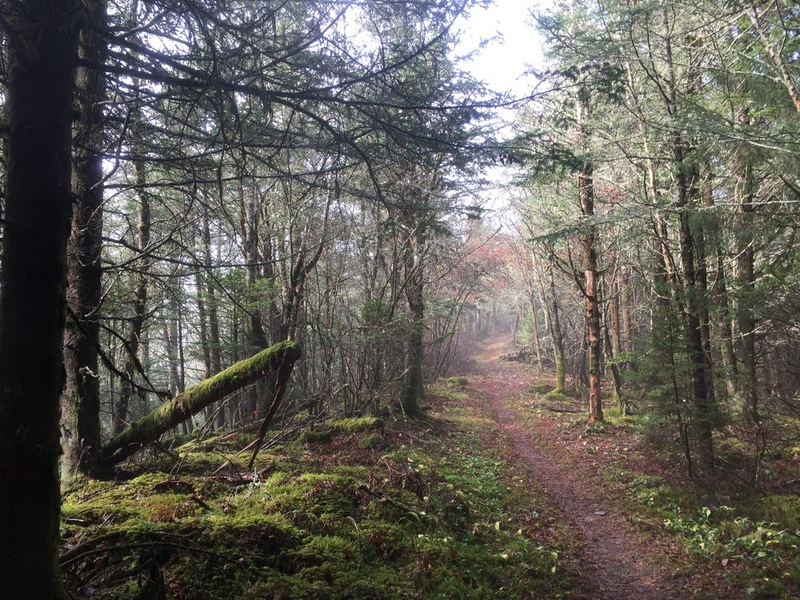 Maury does the entire 73-mile stretch of the AT in the Smokies in both Northbounder (spring) and Southbounder (fall) seasons. Our fourth and final day on the trail had us hiking entirely downhill into the Cosby Campground. Two members of our group were able to spot a black bear yearling on their solo hike this morning and one of them got some incredible photos. We hiked next to a creek on the lower half of the Low Gap Trail, which afforded views of the damage done by the flash flood back in July. A nearly 7-foot-high wall of water gushed down this hillside after a torrential thunderstorm, turning up the creekbed and all the plant life around, closing the Cosby Campground for several days. When we reached the campground we got to wait on our shuttle, which gave us time to reflect on the trip and talk about the things we had learned from each other. We had a long 2-hour ride back up to Newfound Gap and our cars thanks in part to an EIGHT MILE backup where people were getting out of their cars to look at bears on the side of the road. Being that the backup was so terrible, I took the "back way" home - driving out and over the Blue Ridge Parkway. It was a beautiful time to be there being that the leaf color was at full peak. There was very little traffic going this direction and thankfully everyone used the pull-off areas to view the foliage. It was another beautiful trip on the AT in the Smokies. While the last trip I wrote about with my new job, contracting as a guide for REI Adventures, was a backpacking trip, this trip I took was actually doing a front country camping trip. We offer a package called a Family Adventure - you just show up with your family and let us take care of the rest! I spent the morning setting up large tents with cots and tables, lanterns and even welcome mats. We also set up the largest and most elaborate car camping kitchen I've ever seen. For these front country adventures, I use the word "glamping" (meaning glamorous camping) to describe what we actually do. We cook your meals and provide your lunches and snacks for your weekend of adventure! On our first night with our family we cooked a big dinner of pulled pork barbecue, cole slaw, potato salad, and pumpkin pie. After we finished dinner and cleaned up, we took our guests up to an overlook in the dark and did a little star gazing. The skies were completely clear and lit up beautifully. We could see the Milky Way and even saw a satellite! Thanks to one of our other guides who had a star gazing app on her phone, we were able to better see and map constellations I had no idea even existed! The next morning we had a big breakfast consisting of pancakes, bacon, and eggs before we headed out for an easy 7-mile loop hike in Cataloochee Valley. 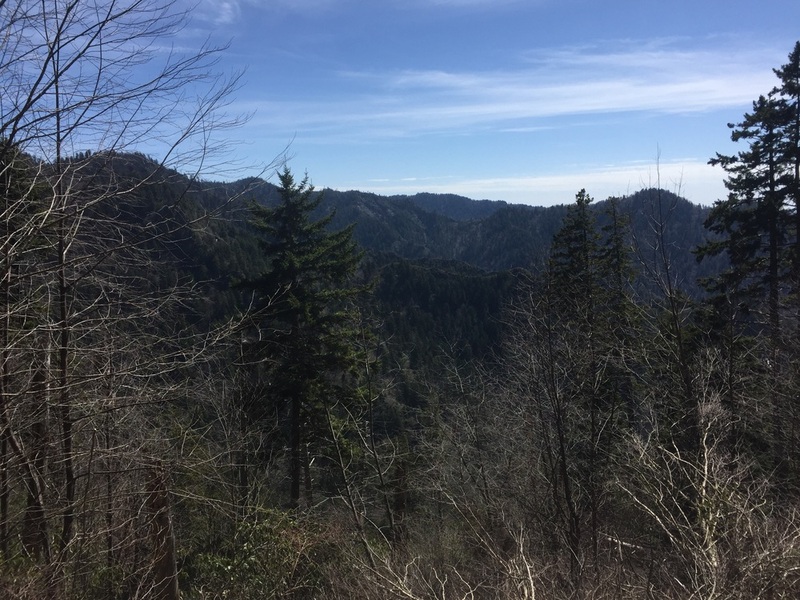 The Boogerman Loop isn't one of the more popular hikes in the park, but it is very scenic and beautiful for all the old growth trees due to being on private land that wasn't commercially logged. After hiking for about 4 miles, we started doing lots of stream crossings on the Caldwell Fork Trail, many of them unbridged since a flood washed them away a few years back. The water was chilly and this weekend was the first major cold snap we have had so far in the Smokies. After getting back into camp for the night, our camp host had made us a dinner of chicken fajitas, rice, beans, chips, and salsa with all the add ons you could ask for! Apple pie for dessert and we were all nice and full before getting ready for tonight's adventure - a night hike to hear elk bugling. A stone wall on the Boogerman Loop hike. The next morning we had to get an earlier start since we were driving nearly 2 hours away to Newfound Gap for a hike on the Appalachian Trail. This morning our group split up into two and I took the energetic kids on a fast-paced hike up to an overlook. After we all met up for lunch, we played some games having the kids identify trees while they were blindfolded - guessing which tree they had touched after having the blindfold removed. I lead the group out to the Icewater Springs Shelter to show them where AT thru hikers sleep on trips through the park and taught them a little about trail culture. We then took a group up to see the overlook at The Jumpoff before beginning our drive back to camp in Maggie Valley. Tonight's menu was spaghetti and meatballs with garlic bread cooked over the fire. We sat with the kids around a campfire and made s'mores and even popcorn before calling it a night. An unnamed view off the Appalachian Trail. The final morning of our trip was a quick breakfast of toasted bagels with honey cream cheese and some fruit salad before saying goodbye. One of our guides was taking the group to go white water rafting and zip lining for their final day on vacation. I got to stay and breakdown and clean up our campsite. Breakdown went much faster than the setup I am happy to report! I got to spend the rest of the morning driving through beautiful Cataloochee and Maggie Valley on my way back to the office. During the cold nights of our trip, the fall colors began to pop even more for a beautiful ride back home.